Στη SEMA η Jeep θα παρουσιάσει το Renegade Frostbite. Το βελτιωμένο Renegade είναι βαμμένο σε λευκό χρώμα, διαθέτοντας μπλε και μαύρες λεπτομέρειες. ειδικά, αυτοκόλλητα, ράφες μεταφορές σκι και snowboard, με το εσωτερικό να κινείται και αυτό στα ίδια χρώματα. Εκεί θα βρίσκεται και το Renegade Riptide. Βαμμένο σε μπλε χρώμα, διαθέτει ράγες οροφής μεταφοράς σανίδας του surf, μαύρες ζάντες και μαύρες δερμάτινες επενδύσεις. Η RAM από τη μεριά της θα παρουσιάσει το 2500 Outdoorsman με ζάντες 17″ και ελαστικά εκτός δρόμου, επεκτάσεις στα φτερά της Mopar, Bilstein αναρτήσεις και γάντζο. Τέλος το Ram ProMaster Hospitality Van είναι μια κινητή επιχείρηση, με το πλαϊνό μέρος του να ανοίγει ώστε να εκθέτονται τα εμπορεύματα που βρίσκονται μέσα του. The Jeep® Renegade Riptide calls out the customizable capabilities of the newest addition to the Jeep brand’s lineup, with a beach-vehicle reimagining of the most capable small SUV. Colored in Vibrance Grandeur Blue paint embellished with a Light Blue base, the Renegade Riptide’s unique black painted wheels act as eye-catching contrast points. The Jeep Performance Parts logo, playfully tweaked to incorporate a surfer in action, is stamped on the rear body sides. Painted satin black accents adorn the front grille, mirror caps and select areas of the front fascia. Above, a surfboard rests on Mopar carrier racks. 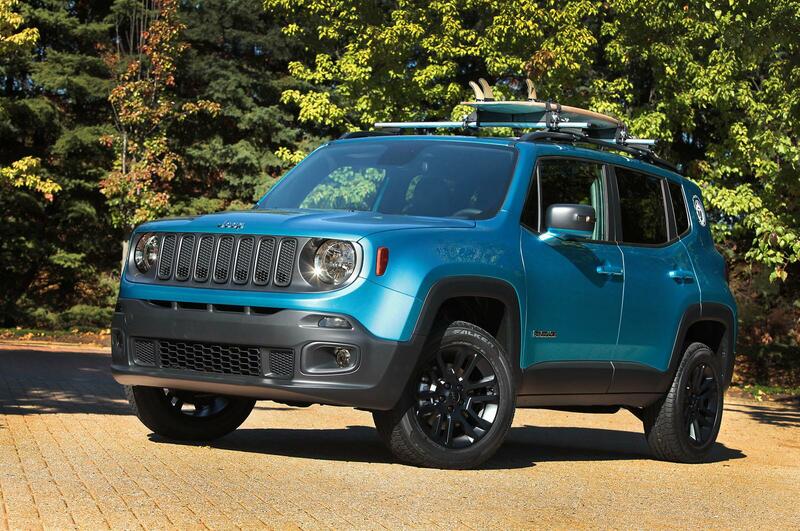 The Vibrance Blue exterior also influences the Jeep Renegade Riptide interior. Blue trim enhances the instrument panels and side panels, and is set off with white accents throughout the interior, including on the Jeep logo area of the steering wheel. Front and rear seats and headrests will be dressed in black leather, while teak floor mats work to reinforce the “surf’s-up” motif. Jeep Renegade Frostbite The Jeep Renegade can be customized to suit any adventurous lifestyle, including those who feel the urge to hit the slopes when the first blast of wintry white stuff falls from the sky, as demonstrated by the Jeep Renegade Frostbite. Reversing the color theme on the Jeep Renegade Riptide, the Frostbite is trimmed in white with blue accents on various exterior areas. Blue wheels with a white outline and a blue grille and mirror caps underline the overall color. The scheme continues inside the vehicle, with Katzkin pearl seats dressed in aqua blue. That same aqua blue hue also fills the perimeter around the doors, as well as the outline of the gearshift and vents. 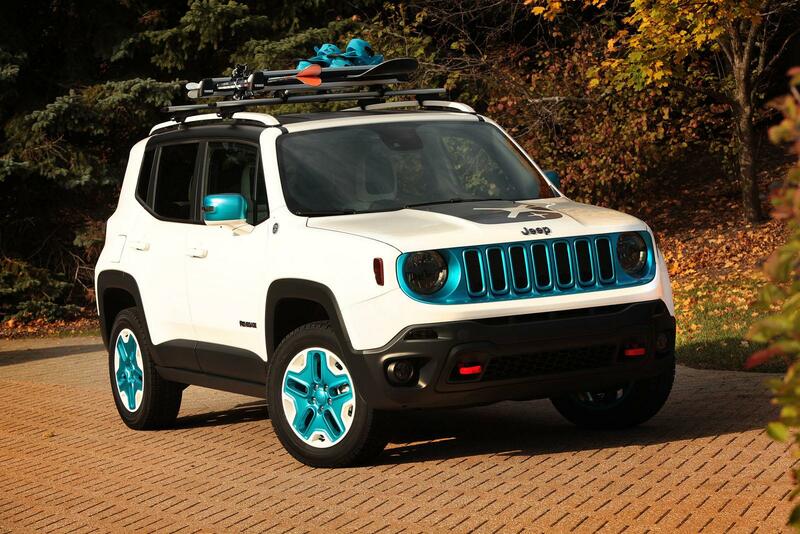 Making the Jeep Renegade Frostbite a true ride for any winter wonderland is a Mopar ski/snowboard roof rack to help safely and securely transport cold-weather toys. The Frostbite also is equipped with a Jeep Performance Parts rock rail guard with stamped Jeep logo to defend against any rugged obstacles blocking the path to the ski lodge. Adding additional visual elements, the Jeep Renegade Frostbite features unique hood and rear Jeep Performance Parts graphics, scheduled for future availability as Mopar accessories. Ram 2500 Outdoorsman For Ram owners who love to head into the wild, the Ram 2500 Outdoorsman elevates the capability of the heavy-duty pickup to the next level. 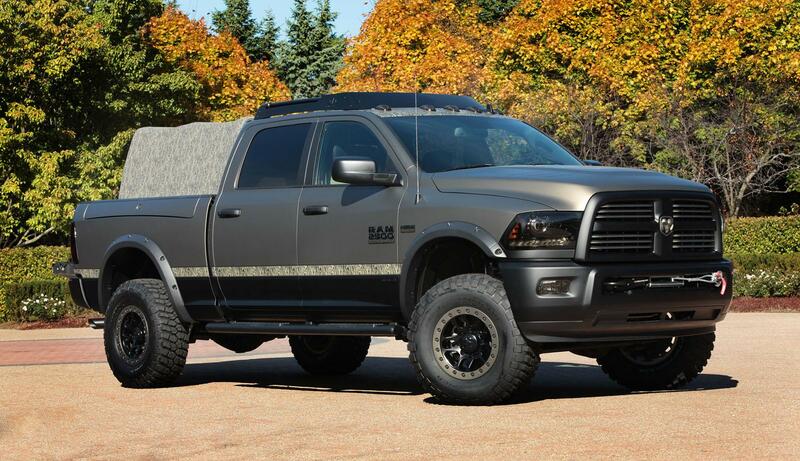 Creating the perfect base camp, the Ram 2500 Outdoorsman is built to blend in with its surroundings with the help of Mopar products and unique camouflage design touches. Ram ProMaster Hospitality Van For those seeking transportation that doubles as an office on wheels, the Ram ProMaster Hospitality Van is the perfect vehicle for business owners looking to upfit and customize their commercial fleet. Modified specifically for the SEMA Show, the Ram ProMaster Hospitality Van is converted into a mobile lounge and equipped with refrigeration to serve refreshing, ice cold beverages from a large swing-open side panel. To focus further on the van’s inherent multipurpose utility, interior cabinets, counter displays and merchandise displays are installed in the cargo area of the vehicle boasting the most vertically oriented side walls of any entry in the cargo van category. This makes the Ram ProMaster Hospitality Van perfect for use as a display vehicle and distribution point for merchandise sales. Low-gloss black graphics near the base of the Ram ProMaster Hospitality Van are contrasted with Mopar Blue graphics on top, while a Mopar logo proudly adorns the windshield.